(272 x 335 mm) 11.7 x 16.5 in. John painted 'The Room When No One Is There' intensely over the course of a year, and it is one of his most beautiful and visionary paintings. It depicts the living room of his house 'Samsara' in Torquay at night 'when no one is there'. Three pieces of bamboo furniture dominate the room, John's large cushioned bamboo throne, the bamboo guest's chair, and the 'magic table' with its glazed ceramic top. 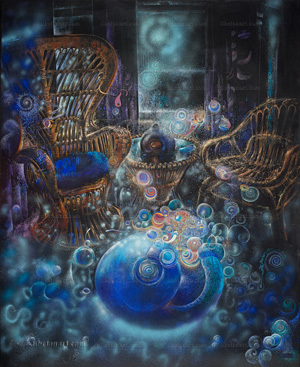 Halos from the street float outside the bay window in the background, and the entire foreground at the centre of the room is filled with spirit energy forms that hover and cascade around an embryonic blue nucleus - which was often perceived by visiting dogs. I am pleased that the intensity of it can penetrate an onlooker's sensibility. I have one week to complete it. Then it must go into the Eisteddfod with some drawings. It is the first figurative painting for ten years. 1979 has been the most traumatic year of my life by a long chalk. This love for Cherry could utterly destroy me if unfulfilled. I am in a state of fearful depression. I must give the children food. As the days have passed and the domestic drama has unfolded it has revealed nothing with any degree of certainty; and as this year has given me torment far exceeding anything known before, I have been finishing the painting "The Room When No One Is There". I look in front of me at the fruits of this agony. Perhaps it is my most powerful painting yet.